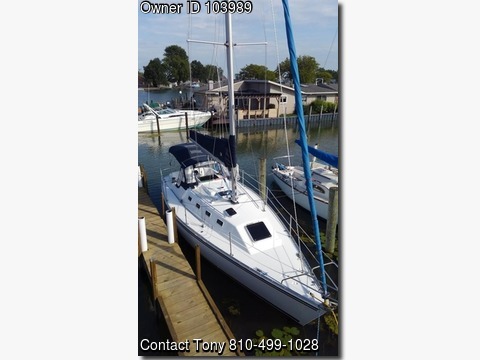 Boat is located in Fair Haven,MI.Please contact the owner @ 810-499-1028...This boat has had a major restoration in 2016. This is a fresh water boat. New in 2016: Epoxy bottom finished in VC 17 Prop shaft, coupler and cutlass bearing Hull and stripes painted with Awlcraft Improved stanchion bases and stanchions w/ FRP backing plates Molded in stanchion base risers Water break added to outboard gunnel Custom spray hood Rub-rail installed w/ Stainless steel cap Solid FRP coring added to baby stay and downhaul areas All deck hardware fasteners potted with epoxy (from jib tracks to bimini brackets) All new Garhauer deck hardware Topsides painted with Awlcraft New deck hatch glass (plastic) Halyards and sheets Kent sail co.
Stack Pack New life-lines (double) Custom binnacle instrument pod with integrated led light (white, blue and red) Custom cockpit table Custom removable aluminum hinged companionway doors finished in Awlcraft B&G Zeus2 9” Chart plotter B&G Triton pack (air transducer w/ repeater display) Airmar Tri-ducer (Speed, Depth and Temp) Raymarine EV-100 wheel pilot Sirius radio antenna Fusion wired remote 6.5” Fusion speakers Port light seals Rebuilt engine (Volvo Model 2002) with less than 100 hours Webasto 12K Reverse heat / air conditioning system 2 Deep cycle batteries 2 19” flat screen TVs (in main cabin and v-berth) 1.3 cubic ft. fridge and microwave installed where stove / oven was (still have stove / oven) All new upholstery Teak and holly floors USB charging ports installed in v-berth, under companionway steps and nav station Extra 110 outlets installed through-out Custom solid FRP Quarter berth headliner finished in Awlcraft Quarter berth Hanging Cloths Netting V-berth hatch interior sunbrella blackout cover New Jabsco toilet Replaced all head hoses Faucet in head Holding tank vent line filter Stainless solar vent. Also Has (Not new): Dodger Bimini enclosure Guest battery charger Magma grill Standard Horizon VHF Reinforced steel cradle Telescoping whisker pole Hydraulic backstay Battened main good condition Pro-furl furling two-slotted foil 155% furling head sail Fair condition Number 2 head sail in good condition New furling line 4 Lewmar self-tailing winches.